An entire menu of delicious options. Catering your guests will remember. Make sure your guests remember your special event for all of the right reasons. Hire a caterer who will provide them with delicious food. 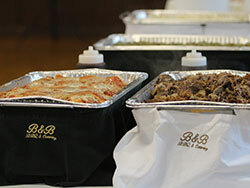 B&B BBQ and Catering provides catering with the focus of your event in mind. Tricia believes that a successful caterer is one that no one will think about during the event because that means the food is perfect and the guests are served without any fuss or issue. Whether you need a caterer for your company luncheon, your customer appreciation dinner, your wedding, or anniversary party, B&B BBQ and Catering will be happy to work hard for you so you can focus on the event. With catering for parties ranging from 10 to 1200, B&B can provide a meal that's perfect for your event. Hire a full-service caterer who will arrive early and stay late, going above and beyond to ensure that your evening runs smoothly. B&B will arrive with the food prepared and keep it warm and ready for your guests. 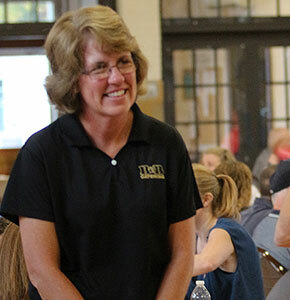 After the food is served, Tricia and her team will fill any needs they see—from refilling drinks to bussing tables—to make sure your guests are well served. Catering so good, you voted for it. Tricia believes there is no point in cooking a meal if it isn't going to be a delicious meal. And apparently the community agrees. 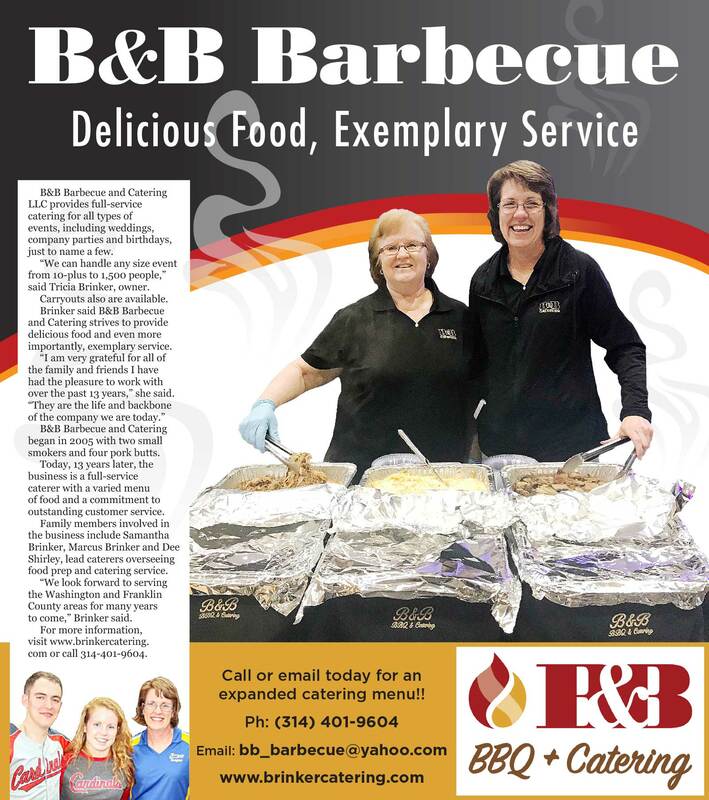 B&B BBQ and Catering has been awarded the Reader's Choice Award from the Missourian's readers for three years in a row! 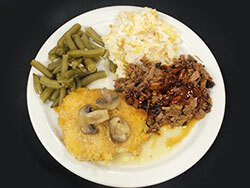 View the article recently published by the Missourian about B&B BBQ here. "Thank you to everyone who voted for B&B BBQ! This area is our home and we appreciate every single customer and every person who let's us know that they like our food and support our business." Food so delicious, it leaves you tongue-tied. It is always so good. Never a disappointment. Tender, juicy, just the right amount of any seasoning. We had this BBQ at an event, and I must say it was incredible!!!! From the meat to the sides it was all great! YUMMMM!! Excellent quality, excellent service, and delicious BBQ! OMGOODNESS... The food is always fantastic!! B&B is great for graduation parties, family reunions, weddings, or anytime you get a group together. Tricia does great work...I highly recommend that you try her sometime!! DELICIOUS is the best way to describe their food. Their Chicken Parmesan is phenomenal and their brisket is amazing! I got some brisket there one day. It was so under and juicy!! Very good!! The food is always delicious and the workers/owner are great people!! We get their food every chance we can!! Tricia Brinker began by selling her BBQ at a Washington gas station near Bluff Road and Highway 100; she sold out in 90 minutes on her first time out. 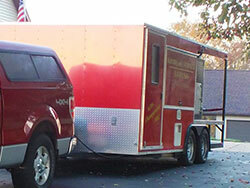 From there, B&B's BBQ pits went on the road and quickly won many awards from BBQ competitions. B&B offers homemade classics and crowd-pleasing favorites. Whether you'd like an entree and all the fixings for every guest, or you just want tasty BBQ for your small get-together, B&B has you covered.